Researching some background information on Aulds who fought during World War 1, I came across the following obituary notice for Alexander Auld that was published in The Biz newspaper in August 1941. Source: OBITUARY. (1941, August 7). The Biz (Fairfield, NSW : 1928 - 1954), p. 2. The sudden death of Mr. Alexander Auld, of 8 Canley Road, Fairfieild, occurred last Saturday, August 2. The end was very sudden, death being caused by a tumor on the brain. The late Mr. Auld was in his 46th year. He is survived by a wife and four children - Robert, Monica, Beverley and Donald. The funeral took place last Monday, for the Crematorium. Rookwood. 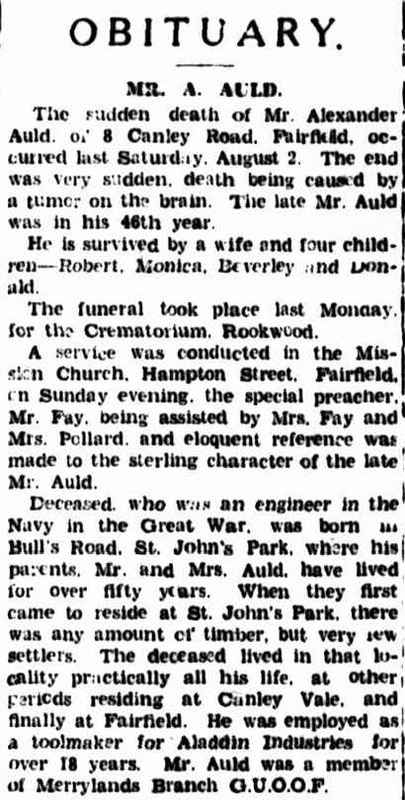 A service was conducted in the Mission Church, Hampton Street, Fairfield, on Sunday evening, the special preacher, Mr. Fay, being assisted by Mrs. Fay and Mrs. Pollard, and eloquent reference was made to the sterling character of the late Mr. Auld. Deceased, who was an engineer in the Navy in the Great War, was born in Bull's Road. St. John's Park, where his parents, Mr. and Mrs. Auld, have lived, for over fifty years. When they first came to reside at St. John's Park, there was any amount of timber, but very few settlers. The deceased lived in that locality practically all his life, at other periods residing at Canley Vale, and finally at Fairfield. He was employed as a toolmaker for Aladdin Industries for over 18 years. Mr. Auld was a member of Merrylands Branch G.U.O.O.F. As this particular obituary is a new one for my research files, I double checked to see if the obituary was listed on the Obituaries Australia website. As it wasn't, I have now submitted the obituary for listing on the site.